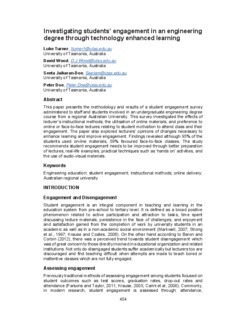 This paper presents the methodology and results of a student engagement survey administered to staff and students involved in an undergraduate engineering degree course from a regional Australian University. This survey investigated the effects of lecturer’s instructional methods; the utilisation of online materials; and preference to online or face-to-face lectures relating to student motivation to attend class and their engagement. The paper also explored lecturers’ opinions of changes necessary to enhance learning and improve engagement. Findings revealed although 95% of the students used on-line materials, 59% favoured face-to-face classes. The study recommends student engagement needs to be improved through better preparation of lectures, real-life examples, practical techniques such as ‘hands on’ activities, and the use of audio-visual materials.